The initial meeting with client will be to discuss the architecture of the project along with the client’s needs, expectations and budget. At this time we will present a variety of different wood species samples for the customer to choose their preference. We will be happy to consult with your architect, builder or interior designer for any design requirements that would need to be taken into consideration. Preliminary measurements will be taken during the first on-site visitation for a CAD layout and design of the project. The second meeting with the client is to present the different design ideas and elevations and select the final draft plan. 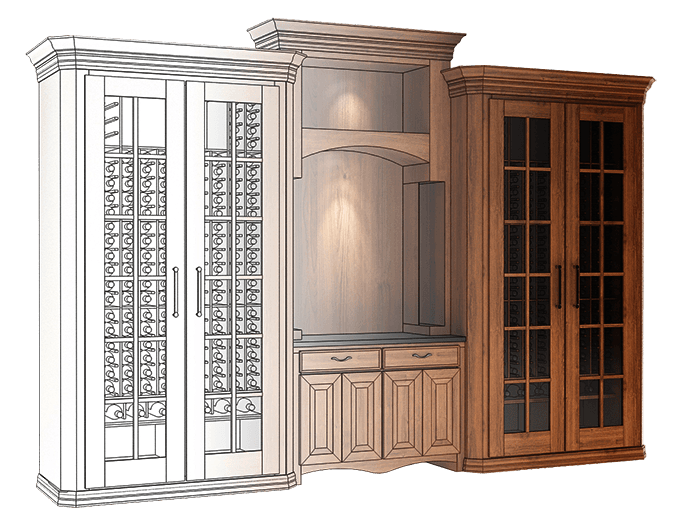 At this time we will make any additional changes needed to suit the client’s preferences then take the final measurements. Once the client has decided on a design layout, a retainer fee may be required, based on complexity, to produce the final CAD drawings, complete with dimensions. This fee can range from $200-$600 depending on the size of the project and is inclusive of the design time, creating working drawings, estimating, and pricing. The project layout and design process can take one to two weeks for completion after the retainer fee has been received. If for any reason the construction of the project does not commence, this fee is non-refundable. The entire retainer fee will be deducted from the projects initial down payment deposit when construction begins. The racking construction phase will begin once the project designs and contract are signed and the initial down payment has been received. Down payments require 50% of the total cost of the project. Construction time on a small project is 3-4 weeks, medium project 4-6 weeks, and a large project 6-10 weeks. These are estimated time frames and may vary depending upon the intricacy of the design and/ or if special ordering of exotic materials is required. A project time may also be extended if the design is changed during construction. Weekly phone calls or emails will be made/sent with updates and the status of the project. This provides an opportunity for the client to respond to any questions about the final design that may come up as well as ask any questions they may have about scheduling, installation, etc. Once the construction of the project has been completed, the client will be notified and an agreed upon schedule will be set for the installation. Before installation is completed, a final invoice will be presented and is due upon completion.